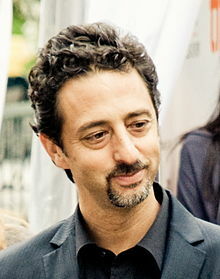 Grant Heslov (born May 15, 1963) is an American actor, film producer, screenwriter and director, known for his producing and writing collaborations with George Clooney, which have earned him three Academy Award nominations. As a co-producer of Argo (2012), he received the Academy Award for Best Picture in 2013. As an actor, he has appeared in films including True Lies (1994), Black Sheep (1996), Enemy of the State (1998) and The Scorpion King (2002), as well as performing supporting roles in several films made with Clooney. Heslov was born in Los Angeles California, and was raised in its Palos Verdes area. His father, Arthur, was a dentist, and his mother, Kerrie (née Rosen), a businesswoman. He has two older brothers, Steven and Michael. His family is Jewish. He attended Palos Verdes High School, then the University of Southern California along with friend (and fellow actor) Tate Donovan. He is a member of Phi Kappa Psi. Heslov is married to Lysa Hayland-Heslov, a producer. Heslov's acting credits include the films True Lies, Dante's Peak, Enemy of the State, The Scorpion King, Good Night and Good Luck, Congo, Black Sheep, and Catch Me If You Can. He has also appeared in such TV series as Happy Days, Family Ties, Mama's Family, L.A. Law, Matlock, Sleeper Cell and The X-Files. In August 2006, Heslov and George Clooney started Smokehouse Pictures and began writing screenplays for production. He was nominated for an Academy Award for Best Original Screenplay (with Clooney) and as producer for Best Film for Good Night, and Good Luck. Heslov also appears in the film as Don Hewitt, the director of the TV series See It Now, around which the movie is centered. He directed a screen adaptation of The Men Who Stare at Goats, starring Clooney, Ewan McGregor, Jeff Bridges, and Kevin Spacey and co-produced The American starring Clooney in 2012. He also worked on 2011's The Ides of March. In June 2012, he was invited to join the Academy of Motion Picture Arts and Sciences. In 2013, Heslov, alongside Clooney and Ben Affleck, won the Academy Award for Best Picture for Argo (2012). The three men also won the Golden Globe Award for Best Motion Picture – Drama and the BAFTA Award for Best Film. ^ "California Birth Index 1905–1995". Center for Health Statistics, California Department of Health Services, Sacramento, California; State of California. Retrieved 2010-02-17 – via familytreelegends.com. ^ Freeman, Hadley (13 February 2014). "Grant Heslov: 'It's great to have Clooney there to crack the whip'". The Guardian. Retrieved 7 October 2016. ^ Abramowitz, Rachel (November 7, 2009). "Grant Heslov, George Clooney team up for 'The Men Who Stare at Goats'". Los Angeles Times. Retrieved April 24, 2010. ^ "Jews in the News: Oscar Time!". jewishtampa.com. Tampa Jewish Federation. February 19, 2013. Retrieved March 19, 2017. ^ "Alumni". USC.edu. USC School of Dramatic Arts. Retrieved 1 April 2019. ^ "Southern California" (PDF). Shield of Phi Kappa Psi Fraternity. Phi Kappa Psi. April 1982. p. 110. Retrieved 1 April 2019 – via phikappapsiarchive.com. ^ "'Nobody's Perfect' Screening In Los Angeles Photos and Images". Gettyimages.ca. Getty Images. 2004-02-19. Retrieved 2017-08-10.